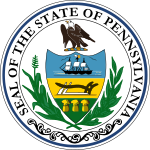 Pennsylvanie is a state in the Unitit States o Americae. It is bund bi sax states (New Jersey an Delaware tae the east, New York tae the north, Maryland an Wast Virginie tae the sooth, an Ohio tae the wast) an bi Canadae at Loch Erie. 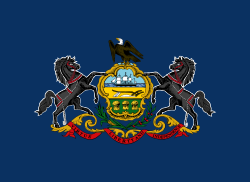 The state is ane o the 13 oreeginal foondin states o the Unitit States; it cam intae bein in 1681 as a result o a ryal laund grant tae William Penn, the son o the state's namesak. Pairt o Pennsylvanie (alang the Delaware River), thegither wi the present State o Delaware, haed earlier been organised as the Colony o New Swaden. It wis the seicont state tae ratifee the Unitit States Constitution, on 12 December 1787. Independence Hall, whaur the Unitit States Declaration o Unthirldom an Unitit States Constitution war drauchtit, is locatit in the state's lairgest ceety o Philadelphia. In the American Ceevil War, the Battle o Gettysburg wis focht in the sooth central region o the state. Valley Forge near Philadelphia wis General Washington's heidquarters in the bitter winter o 1777–78. ↑ "Annual Estimates of the Resident Population for the United States, Regions, States, and Puerto Rico: April 1, 2010 to July 1, 2015 (NST-EST2015-01)". 2015 Population Estimates. United States Census Bureau, Population Division. December 23, 2015. Archived frae the oreeginal (CSV) on December 23, 2015. Retrieved December 23, 2015. Wikimedia Commons haes media relatit tae Pennsylvanie. This page wis last eeditit on 25 October 2018, at 19:55.